A building that would stand amongst the most recognised pieces of architecture in the world. 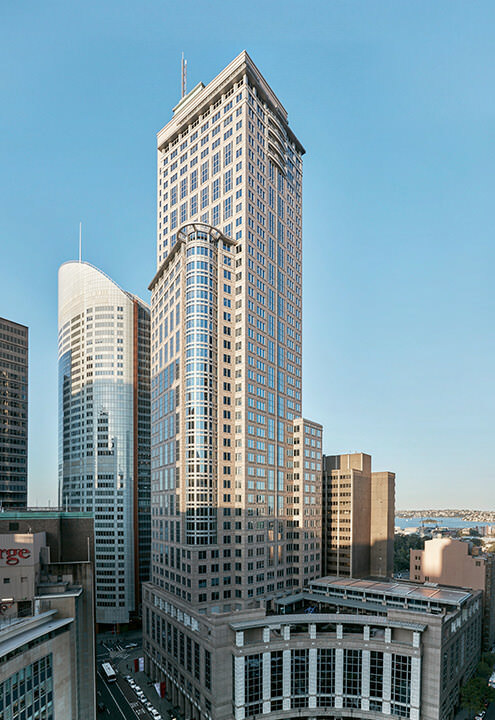 Chifley Tower occupies one of Sydney's most expensive sites, bought for $306 million by the Bond Corporation in 1988, owned by Australian businessman Alan Bond. Built on the most elevated site in the city, when measuring to the top of its spire, it is considered the tallest building in Sydney. During its construction between 1989 and 1992, the building was known as Bond Tower, and replaced the old Commonwealth Government offices. However, the Bond Corporation declared bankruptcy in 1992 and the ownership was transferred to the Japanese construction company Kumagai Gumi. In 1993 the building was renamed Chifley Tower, after former Australian prime minster Ben Chifley and its location at Chifley Square. Chifley Tower welcomed its first tenants in October 1992 and Chifley Plaza opened for business in October 1994. Global investment firm GIC acquired Chifley Tower and Plaza in 2005. Designed by New York architects Kohn Pedersen Fox in association with Sydney firm Travis Partners, Chifley proudly continues a tradition of architectural strength, inspired by the iconic, art deco buildings of New York. A landmark in the Sydney skyline, Chifley towers over the city, built from quality materials of sandstone, marble and steel, the building exudes luxury and opulence with a grand lobby and stunning views over Sydney Harbour. The impressive curved glass façade on the eastern side of the building was designed to represent a glass sail, inspired by Alan Bond’s celebrated America’s Cup victory in 1983.The base of the tower is curved to match the contours of the Qantas House, now the ANZ building, opposite Chifley Square. Occupying almost an entire city block, Chifley takes a corner office in Sydney’s precinct of power, close to both the Law Courts and the State Parliament in the heart of the financial hub. For centre of business, the building enjoys remarkable natural beauty, drawing in the sparkle of the harbour and breathing the freshness of the Botanical Gardens. Close proximity to cultural landmarks like the Opera House and Museum of Contemporary Art, Chifley tenants and guests are offered a refreshing and relaxing diversion in some of the most beautiful surroundings in the country. Take time out between meetings to enjoy modern art and breathtaking views at the world famous MCA. See over 4,000 works by Australian artists or a diverse program of local and international exhibitions throughout the year. Sydney’s oldest public building and seat of the law making body of New South Wales, Parliament House is just a short walk from Chifley. On the edge of The Royal Botanic Gardens, this historic landmark provides a great pit stop on a running track that takes you from Chifley through the Gardens, past the Boy Charlton Pool and Art Gallery of NSW. Take a break and enjoy the panoramic views of the city skyline on the sandstone rock ledge carved out for Governor Macquarie’s wife. A thriving hub of art, culture and history, the iconic Sydney Opera House is perfect for entertaining clients. Australia’s most celebrated theatre offers fine–dining within the famous sails or a relaxing drink against the backdrop of Sydney Harbour. An oasis of 30 hectares at the edge of Sydney Harbour, the Gardens occupy one of Sydney’s most spectacular positions making it the perfect venue to clear the mind whilst enjoying lunch. Alternatively, paved paths will guide you through an outstanding collection of plants from Australia and overseas. Located in the primary legal precinct of Sydney, the Law Courts building accommodates the High Court of Australia, Federal Court of Australia and the Supreme Court of NSW.